The fix ended up being BIOS power profile settings. 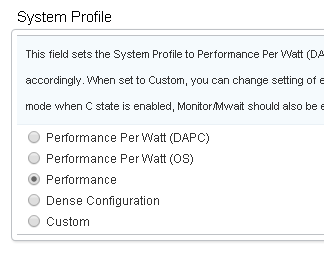 It was set to Performance Per Watt (DAPC) and needed to be set to "Performance". It's very interesting that the BIOS power profile settings didn't seem to affect Ubuntu 14.10's disk read speed. I have three of the same server. All the servers are Dell r620's with a PERC H710 Mini RAID controller (21.2.0-0007_A04 firmware) and have the exact same hard drives (Seagate ST300MM0006) in RAID 1 configurations. I'm seeing about 50% worse disk read performance on some versions of Ubuntu. The BIOS version on the poorly performing machines is 1.4.8, the machine that's performing well is on 1.6.0. The BIOS change log doesn't appear to have any changes between the two versions that would affect anything. The chipset version on the RAID controller of the poorly performing machines is rev 01 (ChipRevision: B0). The machine that's performing well has the rev 05 chipset (ChipRevision: D1). The motherboard chipset revision is also different. At one point, 2 of the rev 01 servers were using Ubuntu 14.04 and were getting similar bad benchmark results. After the upgrading them to 14.10, I immediately saw the disk read speed increase. The performance on rev 01 machine with 13.04 was bad, but somehow the rev 05 machine with the same OS version was performing well. This told me it's not a problem with the megaraid_sas driver, because the rev 01 and rev 05 machines with 13.04 had the same version.